Large institutions like hospitals, restaurants, hotels, caterers and airports need constant flow of clean linens. Part of the linen service process is a timely collection of linens which is a valuable service and essential to the operations of large businesses. The first step to any linen service process is pick up. The hospital, restaurant or hotel place their soiled linens in prescribed areas for retrieval. Our linen service process includes picking up laundry and taking it away to be cleaned, dried, pressed and folded. The pick-up linens are unloaded and sorted. Different items require different types of washing and detergents. Quality linens are hand sorted and pre-cleaned. Heavily soiled linens are placed an area where they cannot contaminate other articles. Greater Vancouver Laundry and Linen Service takes pride in being able to provide a quality product and service on time and in perfect condition. Trained laundry employees start with the sorting process. These employees may be required to use personal protective equipment and standard safety precautions. There may be small items hiding among the larger linen items. Restaurant linens may hide knives or forks that can pierce and puncture workers and damage machinery. These are the reasons why laundry is another customer inspected during the pre-wash and sorting phases. The second step to a commercial linen service process is the washing. Linen is weighed according to how much a washing machine will hold. Usually in a commercial laundry facility huge washing machines are used and operated by a certified washer/operator. Proper cleaning of fine linens depends on the water’s quality, mechanical agitation, time chemical detergents and concentrations and heat. Greater Vancouver Laundry and Linen Service uses pure water and fresh detergents and chemicals, including bleaching compounds. Vancouver Laundry feels that the water and chemicals are the basis of providing spotless linens. The rule of thumb is the longer linens are exposed to heat, mechanical action and detergents, the cleaner they will be. After the linens have been washed, the clean and wet laundry is processed. This is the step where clean linen is dried, ironed and folded. Flatwork items like sheets, pillow cases, napkins and tablecloths are run through a dryer unit until they are no longer damp. Then they are sent to steam powered ironers to be dried, pressed and folded. The result is crisp linen that can be used by your customers without hesitation. Most dryers use hot air and tumbling action to evaporate water and chemicals from linens. Temperatures in dryers must be monitored and controlled. It the dryer isn’t hot enough the linen won’t dry thoroughly. 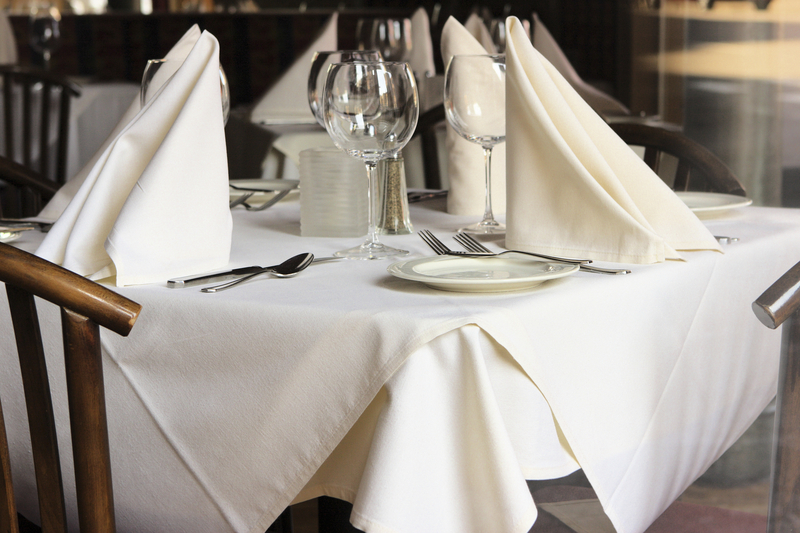 If it is too hot, the restaurant linen may over dry and become damaged and unusable. After drying, linens are sent through heavy steam-heated rollers to press out the wrinkles. Folders then operate mechanical folders to fold the linens into shapes that can be easily handled. The smaller an item is folded, the great the amount of linen that can be packaged. Once the linens have been processed or dried and folded, they are prepared for delivery. Precise records are kept to fill individual orders. Canadian linen that is not required for shipment is marked for storage. This allows facilities to always have a store of clean linen available for their customers. The final step in a linen service business is the delivery. Delivery is a position of trust. Delivery personnel must know the ins-and-outs of the laundry business and have great customer service skills. If delivering laundry to a hospital, delivery people must remember there are confidentiality policies that govern anything that goes in and out of a hospital. It may seem quite simple to work in a commercial laundry, but there are hazards to the job. Canadian linen companies have in place policies that include taking care of common accidents such as chemical exposure, sharp objects in soiled linen, slips on wet floors and exposure to pathogens in contaminated linens. There is also the danger of body parts getting pulled into the machinery. These problems are avoided by standard precautions and common sense, but these accidents can happen. Have you ever thought about the noise levels in an industrial laundry? These noises can be quite high, and disposable earplugs are often issued. Protecting the hearing of workers is a part of the compensation plans in most commercial laundries. Material safety data sheets for all detergent, bleach and other laundry chemicals must be available. Most Canadian linen laundry establishments require their washing machine operators be familiar with occupational hazards. Just like in any other hazardous environment, logs, training, and teaching opportunities must be carried out with employees. Greater Vancouver Laundry & Linen Service follows these procedures to ensure that employees are aware of all dangers. Use a professional linen service for your next patch of soiled linens. You will find that deliveries are regular as clockwork, pick up and drop off can be up to seven times per week, and we have a 24/hour turnaround time. Standards are high in Canadian linen laundry service companies. Teams are committed to providing quality products that include crisp and professionally folded linens. Call a professional linen cleaning service like Greater Vancouver Laundry & Linen service for laundering of linens, towels, uniforms, sheets, table cloths, bedding fabric and mats. We provide you with and on-demand or scheduled pick- up plus swift and friendly drop off services. Our linen service process includes tagging for complete inventory control. We keep your inventory separate from other clients. This includes during the sorting, washing, drying and pressing phases. You do not have to worry that your linens and laundry are getting mixed up with another customers. We guarantee that mix-ups stay to a minimum.